Is NASA's New Jet the Next Concorde? While it's been almost 13 years since a Concorde jetted rich people between NYC and Paris in less time than it takes to watch The Revenant, it looks like the glory days of commercial supersonic flight are still ahead of us -- at least if NASA has its way. The space and aeronautics agency recently announced plans to build a new, quieter supersonic passenger plane that could potentially fill the Concorde-shaped void left in high-end air travel. Notably, the concept jet, described as a Quiet Supersonic Technology (QueSST) X-plane, would emit a soft thump, or "heartbeat," when reaching supersonic speeds instead of the huge bang known as a sonic boom, according to a press release. NASA said it has awarded a $20 million contract to aerospace and defense technology giant Lockheed Martin to complete the preliminary design over 17 months, which will then be used to construct a QueSST for testing sometime in the next several years. “NASA is working hard to make flight greener, safer and quieter – all while developing aircraft that travel faster, and building an aviation system that operates more efficiently,” NASA Administrator Charles Bolden said in a statement. “To that end, it’s worth noting that it's been almost 70 years since Chuck Yeager broke the sound barrier in the Bell X-1 as part of our predecessor agency's high speed research. Now we’re continuing that supersonic X-plane legacy with this preliminary design award for a quieter supersonic jet with an aim toward passenger flight." 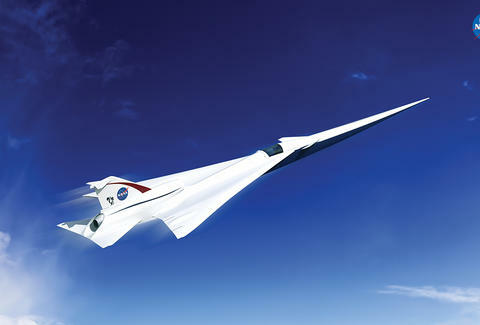 Following a successful preliminary design from Lockheed Martin, NASA said it will award an additional contract to finalize and construct the supersonic aircraft. The first manned flight tests could launch as early as 2020, depending on funding, according to the release. The exciting plans come amid similar efforts to get supersonic passenger jets back in the sky such a project spearheaded by Airbus, which means it might not be too long before you're zooming to Hawaii in just a fraction of the time, well, if a seat is even remotely affordable. Tony Merevick is Cities News Editor at Thrillist and would love to travel on one of these things someday. Send news tips to news@thrillist.com and follow him on Twitter @tonymerevick.